G. R. Wood & Co. Wood Toner - Goosebay Sawmill and Lumber, Inc.
WOOD TONER is a natural resin waterborne solution with compatible dyes. It is used to stain and seal raw wood in one step and to add color between coats of finish. Toner is compatible with most brands of finish and is especially useful when used in combination with G.R.Wood Essential Varnish. 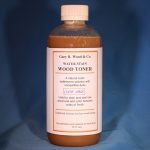 The wood toner we stock is clear and is readily combined with Fiddes Water Stain or Pine Water Stain to create a variety of colors. Tinted Wood Toner can be special ordered. Amber, Red Mahogany, and Walnut can be combined to create 7 colors. It is also available in black. On Bare Wood: Wipe on 1-2 coasts, working swiftly in the direction of the grain where possible. Very lightly sand with 320 or higher grit sandpaper between coats. Additional coats are not recommended. Wood Toner will not spread like an oil based stain, making it possible to stroke precise lines, without bleed, when necessary. Top coat with any G.R. Wood finish. Toner, on bare wood, is compatible with most brands of finish, but always test first. Use Between Coats of Finish: For a decorative finish (on surfaces that aren’t exposed to spills or abrasion) apply alternate coats of Toner and Essential Varnish using a wipe-on technique. Build a number of layers to the color and depth desired. The final coat should be Clear Toner followed by polishing with paste was, such as Fiddes Supreme Wax Polish. A single coat of Toner may also be applied between coats of G.R. Wood oil varnish formula to enhance the finish or lightly alter the color. Toner is compatible between coats of many brands of finish, but always test first. As an Isolating Medium: Apply 1 coat of clear toner between coats of G.R. Wood Shellac. Use a very light touch when applying shellac over Toner, to avoid pulling color. Brush or spray shellac if necessary. As a Conditioner: Wipe on a coat of clear Toner and leave to dry. Lightly sand with 320 or higher grit to smooth raised grain. Conditioning allows any subsequent application of colored Toner to penetrate evenly. How to Apply: The recommended application is with teabag cloth or a G. R. Wood Water Polish Pad. Quality burlap is an excellent burnishing cloth. 320 grit paper with a foam backing is useful for sanding between coats. Save worn out sandpaper for the final sanding.